March 8, 2016 – Medical implants and spacecraft can suddenly go dead, often for the same reason: cracks in ceramic capacitors, devices that store electric charge in electronic circuits. These cracks, at first harmless and often hidden, can start conducting electricity, depleting batteries or shorting out the electronics. Now, after years of effort by manufacturers and researchers, the National Institute of Standards and Technology (NIST) and collaborators have demonstrated a nondestructive approach for detecting cracks in ceramic capacitors before they go bad. 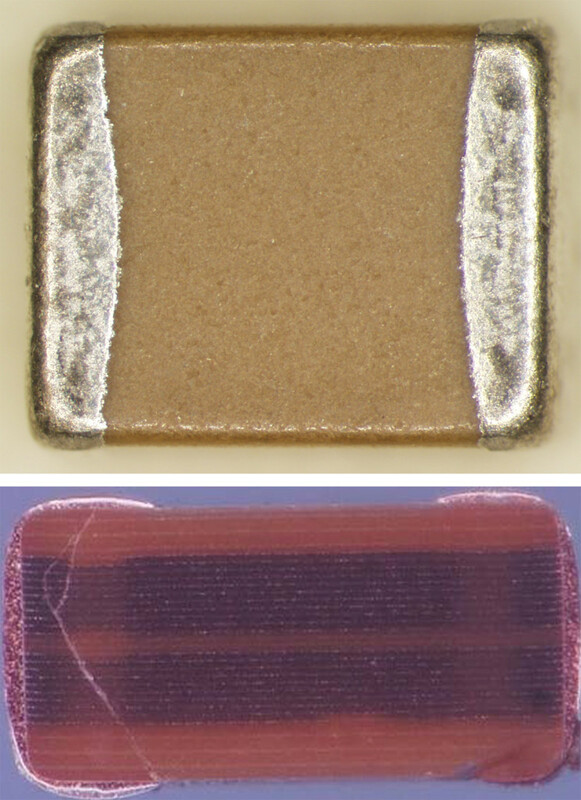 In the study, the prototype method led to the rejection of more than 90 percent of sample capacitors with visible cracks. Once further studies quantify and confirm detection levels, the new technique may help prevent failures in medical devices such as cardiac pacemakers and defibrillators and also avert electronics failures in satellites and other spacecraft. The new method may also detect structural flaws in other types of materials, researchers say. NIST researchers invented the technique, and the study of crack detection levels was carried out with collaborators from the University of Maryland, NASA Goddard Space Flight Center, and Colorado State University. The research grew out of an International Electronics Manufacturing Initiative (iNEMI) consortium working group. This group, which included NIST staff, focused on improving the reliability of multilayer ceramic capacitors for mission-critical electronics. The group concluded that nondestructive methods should be developed to detect cracks in capacitors before they evolve into electrically conducting pathways and cause failures. Because they can store a lot of energy for their size, multilayer ceramic capacitors are widely used and have an annual market in the billions of dollars. But their failure rates, while low, have long been considered a problem in some applications. A NASA study notes that capacitors are the electronic component most likely to fail. Capacitors can crack during manufacturing, assembly or use because ceramics are brittle and the devices are exposed to heat and mechanical stress. Industrial screening — such as automated visual inspection, X-rays and acoustic microscopy — may not find subsurface cracks, especially near corners under capacitor endcaps, where stress can be highest. A study of Food and Drug Administration data for several million pacemakers and defibrillators implanted in 1990-2002 found that about one in 150 failed, about one quarter of these failures were battery/capacitor abnormalities, and 61 people died due to device malfunctions. The new NIST crack-detection method relies on acoustic measurements at frequencies much higher than humans can hear. Researchers briefly apply an electric field across the electrodes of a capacitor, exciting a vibration at a specific frequency. They then measure the decay over time (called ringdown) of the signal. These data are analyzed to determine slight shifts in frequency versus the magnitude of the vibration. These shifts are greater when cracks are present. This nonlinear approach—focusing on frequency shifts relative to signal strength rather than the frequency shifts alone—is especially useful because it is not affected by slight variations in size of the capacitors. A familiar example of nonlinear acoustic effects is the way a violin’s tone changes when the bow is pulled more forcefully. The ceramics in the NIST study are highly nonlinear, meaning the capacitors get less stiff and their resonant frequency drops when they vibrate more strongly. The new NIST method measures patterns in how this tone changes over time in relation to the strength of the vibrations. Researchers measured 41 multilayer barium-titanate ceramic capacitors, each roughly 2 by 3 millimeters in size, before and after heating to high temperatures (189 °C) and quenching in ice water. This thermal treatment generated surface-breaking cracks in 27 samples. The nonlinear acoustic results were strongly correlated with the presence of visible cracks: Measurements on 25 of the 27 visibly cracked capacitors yielded results that were outside the range of those for capacitors without cracks. The study concluded that nonlinear acoustic measurements offer a promising approach for nondestructive detection of cracks in capacitors before electrical failure occurs, and that further work should be pursued to quantify the level of detection. NIST staff are continuing this research in collaboration with a capacitor manufacturer.